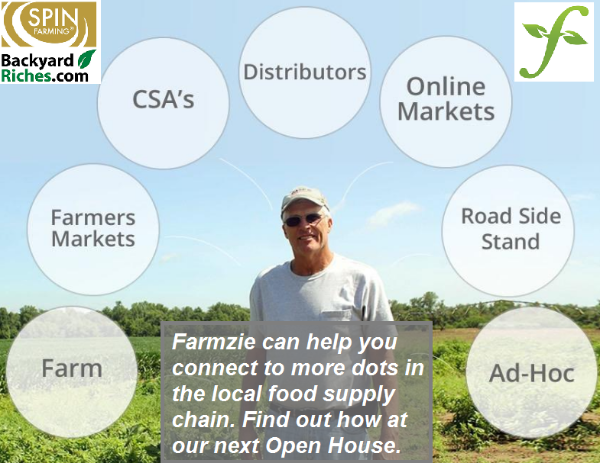 Webinar: SPIN-Farming and Backyard Riches Open House | Farmzie : Local Farms, Local Markets. CSA's are becoming more customized. Farmers markets come and go. More and more restaurants are opting out of the industrial food supply chain. All of this represents opportunity for SPIN farmers - and technology can help you connect to and manage it. See how in this session with Griffe Youngleson when he shows you his new Farmzie app. The webinar is scheduled for Thursday, July 18, 2 pm ET. RSVP here. Farmzie gives customers the ability to make purchases online from small farmers just as they would from a big company, giving them the convenience and flexibility they want while still supporting local agriculture.